Indian television audiences are about to be wowed by a story of devotion and divinity. Starting November 30th, &TV presents a socio-mythology 'Santoshi Maa', the story of Goddess Santoshi and her ardent devotee's undying belief. 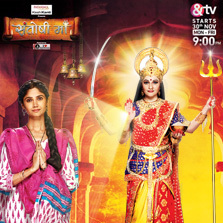 The show marks the comeback of popular Bollywood actress Gracy Singh as Santoshi Maa and the very talented Ratan Rajput as her devotee. Produced by Rashmi Sharma Telefilms, Santoshi Maa is the story of Santoshi, a loving girl with a heart of gold who has been a worshipper of the Goddess since childhood. Much like the Goddess of santosh or contentment, Santoshi has no malice or greed in her heart and believes in respecting every individual. The show will chart her journey and how her unfaltering faith in the Goddess bails her out of the most difficult situations. Tune into this divine intervention as Santosh ka path padhane aa rahi hai Santoshi Maa starting 30th November, every Mon-Fri at 9:00PM only on &TV! Other than the two stellar performers, the show brings together some of the best names in the industry to essay pivotal roles. The ensemble cast includes popular faces such as Ayaz Ahmed, Sayantani Ghosh, Sachin Shroff, Juhi Parmar, Kiran Janjani, and veterans including Parikshit Sahani, Upasna Singh and Onkardas Manekpuri among many others. Talking about the show, Rajesh Iyer, Business Head &TV said "Santoshi Maa marks our foray into the socio-mytho genre thereby strengthening our programming slate. The concept of Santoshi Maa is introspective and very relevant given today's evolving times. Furthermore, its universal theme and relatable plot will only enable us to reach out to a wider set of audience at a 9:00PM primetime slot." Actress Gracy Singh who portrays Goddess Santoshi said "All these years I received so many offers for TV shows but nothing appealed to me. But I loved the concept of Santoshi Maa. It has a great storyline, much relevance in today's times and is being made with a lot of sincerity. Portraying a Goddess on the small screen is extremely challenging but also satisfying at the same time. I am a believer myself and given the competitive environment that we are in, I don't let negativity affect me, but I take time off to relax and enjoy and be content with what I have achieved. That's what the show is also about. I look forward to receiving a positive response from the viewers." The show that boasts of a great production, storyline, characters will be one of the most relatable shows that will have the audiences enamored! Stay tuned and watch Santoshi Maa starting 30th November every Mon-Fri at 9:00PM only on &TV!